How do you feel about eating that 4 day old salad you left in the fridge? 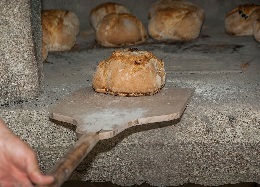 And do you remember the smell of fresh baked bread or pastries right out of the oven at your local cafe? Do you watch the nightly news now or old reruns from last week? The word fresh means a lot when you’re grocery shopping or out for your morning walk. It turns out fresh is big with Google, Facebook, Instagram, and Linkedin too. For some reason, they believe Now is important. Content strategists may not talk about freshness very often, but we all know from our analytics, that old content doesn’t get read much. It’s not quite as enjoyable. It might as well be put away in the archives. And in the era of social media, everyone expects or prefers fresh content. If Google changed its search box to let users choose the date, most searchers would turn off anything older than 3 years. 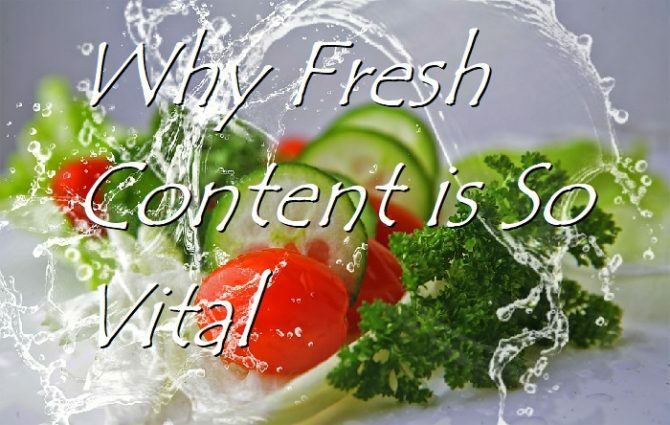 It’s often the freshness of content that draws people to Facebook, or Twitter or to your blog. We all like the feeling of spontaneity, novelty, and real time interaction. 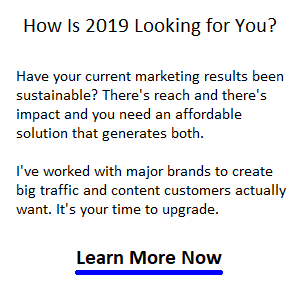 In this post, I wanted to point out how new content and updated content can catapult your Google rankings and help keep your customers better informed, engaged, and confident in your company. It’s important for a digital marketing specialist of any type to be mindful of the quality of their content. And freshness is a part of it. What’s with This Old, Outdated Stuff? When I research websites to understand a prospect’s content, one common thing that jumps out right away is how out of date their content is. Sometimes they just plain gave up on their blog, FB posts, and other material. That doesn’t really send a good message. Many times, their blogs and other material was produced years ago. Who wants old news? But then again, who has the time to update a huge library of web content? If your website has or does generate a lot of content, that stale content will not produce the visits and visitor engagement you want, nor high Google rankings. Key Point: fresh, updated, evergreen content is more powerful, sustainable, and makes a laser-like branding impression. Believe it, your content is worth it. Outdated, stale content doesn’t do much for your current customers either. In fact, it could be sending them the message that your company is behind the times. It’s an error in customer communications. What is Fresh Content Anyway? Fresh Content is up to date, which means visitors and customers are more assured and confident that the info they’re consuming is relevant and accurate. Who can make buying decisions on outdated information? That’s kind of risky and could lead to business losses. For that reason and many others, Google decided to make content freshness an important component of their algorithm. In fact, they filed a patent for it. The importance of freshness however is relative to other factors they take into account. That means if your content is of the low quality, non-engaging variety, it may not matter as much. Yet, if you have a high ranking, high domain authority, relevant website, Google may be eager to spider your content very quickly. Yet, as you know, Google does assess your site’s trustworthiness and keyword/topic relevance, so your content updates will be “processed” to discover their true merit. A good SEO copywriter can take this into account when doing updates. From moz.com whiteboard Fridays, Rand Fishkin said the Fresh factor affects 30% of queries, however freshness would apply to all keyword searches, just some more than others. Google can measure user’s engagement in your content too, and notice changes in visit times, clicks, scrolling, and more. Googlebot can determine that you’ve changed your content and that users are liking it. In response, those pages will enjoy higher rankings. So when you’re managing your content and worrying too much about library science you should instead focus on user engagement. With fresh as a priority, you’re getting at the things Google, Bing, and Yahoo all care about. Freshness was a big topic a few years back when Google didn’t have what is called “realtime” capability which DuckDuckGo had. That’s when they acted to include a freshness factor. They initially called it the Cafeine algorithm update. Today, this freshness rating would be controlled by RankBrain and all keywords according to Google engineers, are not treated the same. That’s getting into technical territory, so let’s keep it simple for you. You need to update your content intelligently for continued high Google rankings. If you pay attention to each of these factors you’ll find as I have, a reward of higher rankings. And you’ll likely make a bigger impact on your visitors. What are The Fresh Content Factors? As part of your social media strategy or visitor engagement strategy you’ll want design your content so that it can be refreshed continuously in a way that Google trusts and which lets you repost it repeatedly on Facebook, Buzzfeed Twitter or Linkedin. With fresh new angles, you can post it forever and people will love it. If it grows its own cult or following, wow, you’re brilliant overachiever (make sure you let me know). New content is great so keep on blogging. However, it’s actually that old content when revitalized that generates the big traffic (and qualified prospects too). It’s important when you update your content, that you you don’t overoptimize by accident. Vary the words you use, especially in hyperlinks . Google can tell when you’re beefing things up to get better rankings. This is where SEO skill is invaluable. This isn’t the ultimate oracle about the freshness factor, but it will help you. I hope you’ll return for farm fresh nutritious updates, (nudge nudge wink wink). It’s like a vitamin shot for your web marketing. Oh, and please do pass this post onto your digital marketing coworkers, copywriters, bloggers, and your CEO. They’ll like you for it. In fact why don’t you blog about this topic yourself? If you have some good ideas on content freshness, make sure you leave a comment below.